Johan Cruyff has thanked supporters for their good wishes after it was confirmed he had been diagnosed with lung cancer. 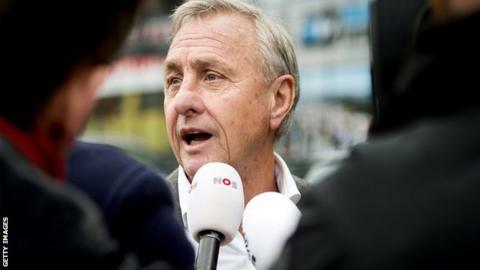 The 68-year-old Netherlands great and three-time Ballon d'Or winner was told of his illness this week after tests. "Thank you for all your support," said the former Ajax player on Twitter. Cruyff's son, former Manchester United midfielder Jordi, also said: "Thanks a lot for your supportive messages. Much appreciated." He also won three consecutive European Cups with Ajax and went on to play and manage at Barcelona, with both clubs sending out messages of support. Former Ajax, Manchester United, Juventus and Fulham goalkeeper Edwin van der Sar, now a director at the Dutch club, said: "On behalf of the club, I wish Johan and his family a lot of strength and a speedy recovery." Barcelona president Josep Maria Bartomeu tweeted: "Johan, you'll win this one too. The whole club is behind you." While in charge at the Spanish club, he led them to their first European Cup win in 1992 and the European Cup Winners' Cup in 1989. His last managerial appointment came at the Catalonia national team, where he was in charge from 2009 to 2013.